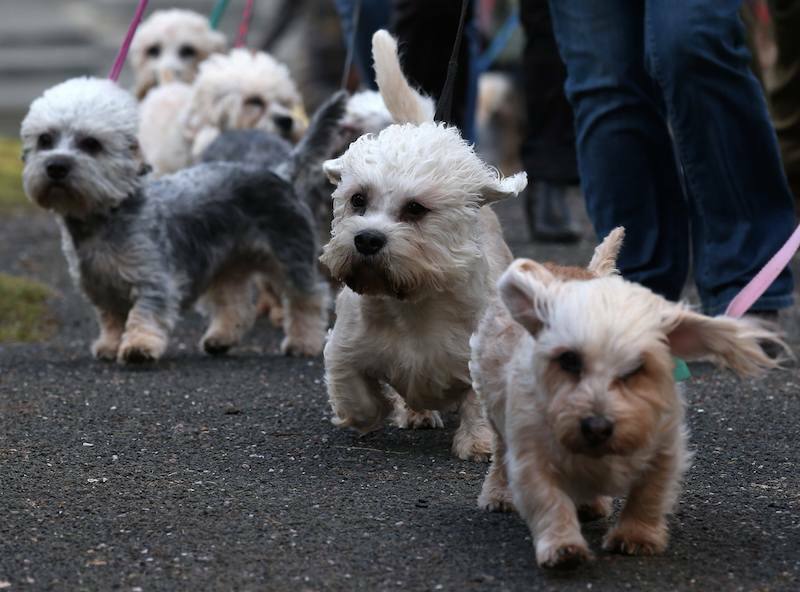 Dandie Dinmont Terrier acquired its unique name after Sir Walter Scott penned the novel Guy Mannering in 1814. In the book, the character Dandie Dinmont kept a strain of pepper-and-mustard terriers used to kill badgers, foxes and otters. The book was an instant best-seller and people wanted Dandie Dinmont’s Terriers. Queen Victoria owned and bred Dandie Dinmont Terriers. 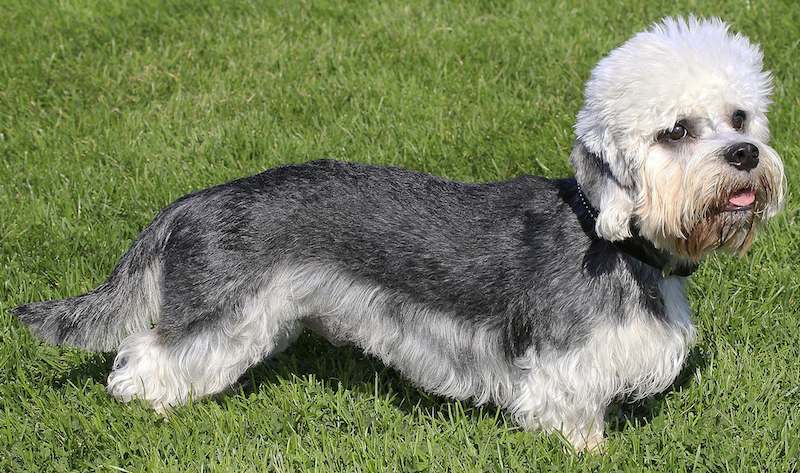 Dandie Dinmont Terrier Size: The height should be from 8-11 inches (20-28 cm) at the top of the shoulder. Length from top of the shoulder to root of tail should not be more than twice the dog’s height, but preferably 1-2 inches (3-5 cm) less. Weight The preferred weight from 18-24 lb. (8-11 kg). These weights are for dogs in good working condition. Coat: The coat is a very important point; the hair should be about 2 inches (5 cm) long; that from skull to root of tail, a mixture of hardish and soft hair, which gives a sort of crisp feel to the hand. The hair should not be wiry; the coat is what is termed piley or pencilled. The hair on the underpart of the body is lighter in colour and softer than on the top. The skin on the belly accords with the colour of dog. Dandie Dinmont Terrier Colours: The colour is pepper or mustard. The pepper ranges from a dark bluish black to a light silvery grey, the intermediate shades being preferred, the body colour coming well down the shoulder and hips, gradually merging into the leg colour. The mustards vary from a reddish brown to a pale fawn, the head being creamy white, the legs and feet of a shade darker than the head. The claws are dark as in other colours. 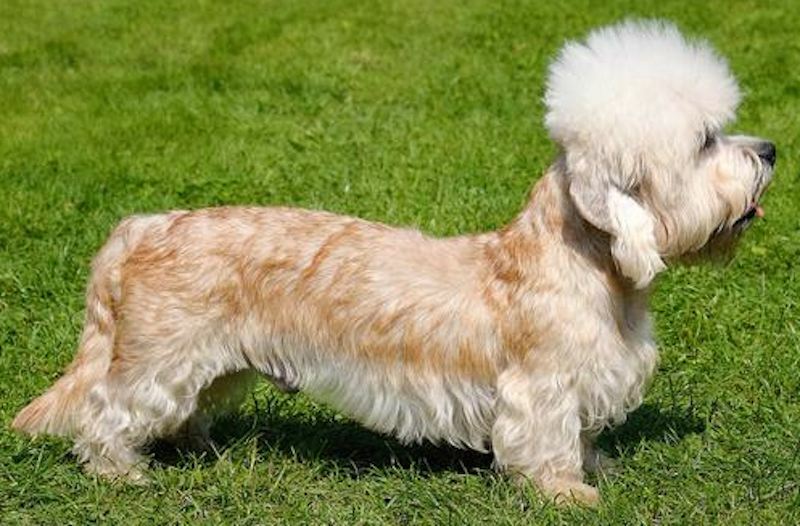 (Nearly all Dandie Dinmont Terriers have some white on the chest, and some also have white claws). 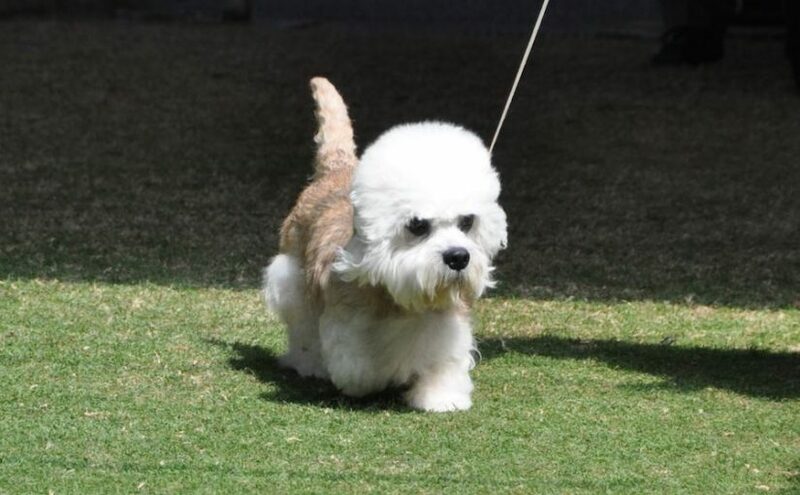 Dandie Dinmont Terrier Head: Strongly made and large, not out of proportion to the dog’s size, the muscles showing extraordinary development, more especially the maxillary. Skull broad between the ears, getting gradually less towards the eyes, and measuring about the same from inner corner of the eye to back of skull as it does from ear to ear. The forehead well domed. The head is covered with very soft silky hair, which should not be confined to a mere topknot, and the lighter in colour and silkier it is the better. Cheeks starting from the ears proportionately with the skull have a gradual taper towards the muzzle. Muzzle deep and strongly made, and measures about 3 inches (8 cm) in length, or in proportion to skull as 3 is to 5. It is covered with hair of a little darker shade than the topknot, and of the same texture as the feather of the forelegs. The top of the muzzle is generally bare for about 1 inch (3 cm) from the back part of the nose, the bareness coming to a point towards the eye, and being about 1 inch (3 cm) broad at the nose. Nose black or dark-coloured. Mouth black or dark-coloured inside. Teeth very strong, especially the canines, which are of extraordinary size for such a small dog. The canines fit well into each other, so as to give the greatest available holding and punishing power, and the teeth are level in front, the upper ones very slightly overlapping the under the ones. (Many of the finest specimens have a “swine mouth”, which is very objectionable, but is not so great an objection as the protrusion of the underjaw.) Eyes set wide apart, large, full, round, bright, expressive of great determination, intelligence and dignity; set low and prominent in front of the head; colour a rich dark hazel. Ears pendulous, set well back, wide apart, and low on the skull, hanging close to the cheek, with a very slight projection at the base, broad at the junction of the head and tapering almost to a point, the forepart of the ear tapering very little – the tapering being mostly on the back part, the forepart of the ear coming almost straight down from its junction with the head to the tip. They should harmonize in colour with the body colour. In the case of a Pepper dog, they are covered with a soft straight brownish hair (in some cases almost black). In the case of a Mustard dog the hair should be mustard in colour, a shade darker than the body, but not black. All should have a thin feather of light hair starting about 2 inches (5 cm) from the tip, and of nearly the same colour and texture as the topknot, which gives the ear the appearance of a distinct point. The animal is often one or two years old before the feather is shown. The cartilage and skin of the ear should not be thick, but rather thin. Length of ear from 3-4 inches (8-10 cm). Forequarters: The forelegs short, with immense muscular development and bone, set wide apart, the chest coming well down between them. The feet well formed and not flat, with very strong brown or dark-coloured claws. Bandy legs and flat feet are objectionable. The hair on the forelegs and feet of a Pepper dog should be tan, varying according to the body colour from a rich tan to a pale fawn; of a Mustard dog they are of a darker shade than its head, which is a creamy white. In both colours there is a nice feather, about 2 inches (5 cm) long rather lighter in colour than the hair on the forepart of the leg. Dandie Dinmont Terrier Body: Long, strong, and flexible; the back rather low at the shoulder, having a slight downward curve and a corresponding arch over the loins, with a very slight gradual drop from top of loins to root of tail; both sides of backbone well supplied with muscle; ribs well sprung and round, well developed and let well down between the forelegs. Hindquarters: The hind legs are a little longer than the forelegs, and are set rather wide apart but not spread out in an unnatural manner, while the feet are much smaller; the thighs are well developed, and the hair of the same colour and texture as the forelegs, but having no feather or dewclaws; the whole claws should be dark; but the claws of all vary in shade according to the colour of the dog’s body. Tail: Rather short, say from 8-10 inches (20-25 cm), and covered on the upper side with wiry hair of darker colour than that of the body, the hair on the underside being lighter in colour and not so wiry, with nice feather about 2 inches (5 cm) long, getting shorter as it nears the tip; rather thick at the root, getting thicker for about 4 inches (10 cm), then tapering off to a point. It should not be twisted or curled in any way, but should come up with a curve like a scimitar. The tip, when excited, being in a perpendicular line with the root of the tail. It should neither be set on too high nor too low. When not excited, it is carried gaily, and a little above the level of the body.